Claire Frost: How do you see your work and your practice fitting into CounterPulse’s space + programming? How does this space contextualize (or not) your work? Brea Weinreb: Similar to CounterPulse, community is integral to my work. Every figure painting I’ve ever made has been of someone I know, and most of those people live here in the Bay Area alongside me. 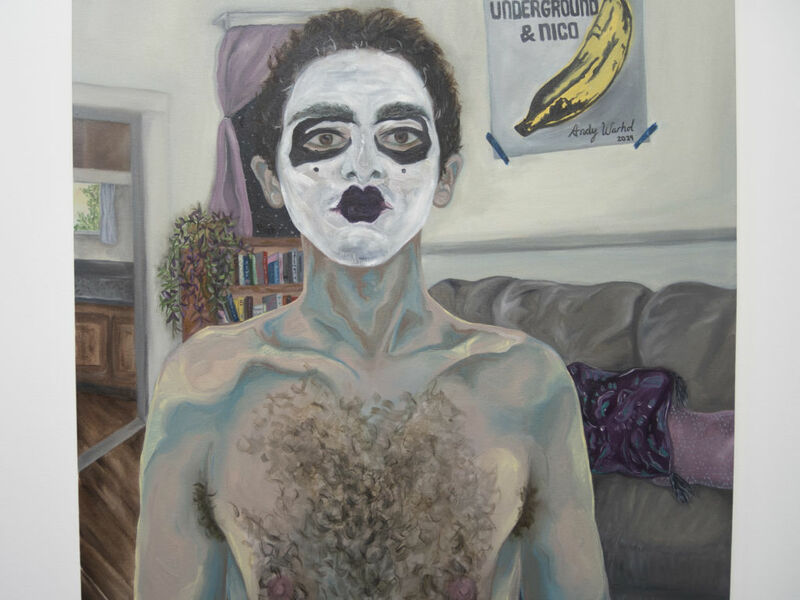 Particularly with this new body of work that I’ll be showing, I am interested in how looking to the past and incorporating references to queer (art) history creates room for connections and community-building in the present. It was this idea, coupled with CounterPulse’s unconventional space and programming, that inspired a collaboration between myself and Bay Area drag queen Venus Soleil for this show. We have been working on an experimental drag performance that pays homage to Sylvester, the fabulous disco queen who was also from San Francisco. The choice of Sylvester was intentional given CounterPulse’s physical location, and the mediums we are using (film, photography, and live performance) are also inspired by Counterpulse’s interdisciplinary space. Venus and I are excited by the potential to call Sylvester into conversation while simultaneously building upon his legacy in the San Francisco queer and experimental art community. CF: It sounds like CounterPulse as a performance venue has been important to the development of this show. Do you feel that performance also plays a role in your 2 dimensional paintings? BW: Definitely! I take all my own reference photos for my paintings and I’ve always found this process extremely performative – the posing, the dressing up and just the personalities of the people I work with and my relationships to them creates an environment where we feel comfortable to try on different roles and take them to the extremes. My favorite reference photos have always stemmed out of the moments that are the most ridiculous and unplanned. For example, one time I was taking photos of a friend in the living room of the co-op they lived at, and someone else from the co-op literally pirouetted like a ballerina into the frame of the photo – and that resulted in one of my favorite paintings I’ve ever made. In the past year or so I’ve become more interested in the performative aspect of my reference photo process and I’ve begun to explore it further by recording Super-8 footage and taking photographs that can stand on their own. This exhibit at CounterPulse will be the first time that I’m really revealing these aspects of my process and displaying it alongside my paintings. CF: Do you see your paintings as documentations of these performative posings? Or do they make a departure from those moments to say something else entirely? BW: I hope for my paintings to somehow do both. I am interested in paying tribute to my community while simultaneously using our bodies and experiences to grapple with deeper questions of gender, desire, and cosmological existence. I think the photographs placed alongside the paintings function to tell two parallel stories, the former grounded in reality and the latter more fantastical, while also leaving enough room for the viewer to craft their own meanings.